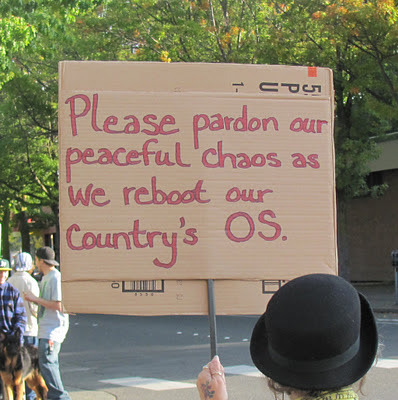 Good message about rebooting our country's operating system, held at Magnolia and Cornwall October 14. So many issues interrelate. 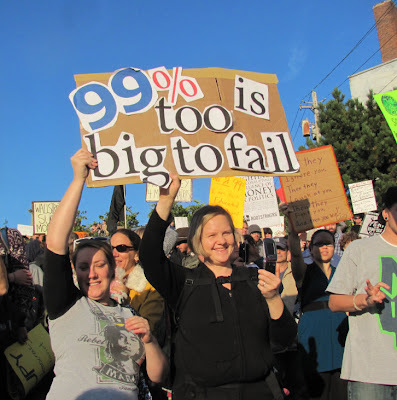 People often ask what Occupy Wall Street is about. 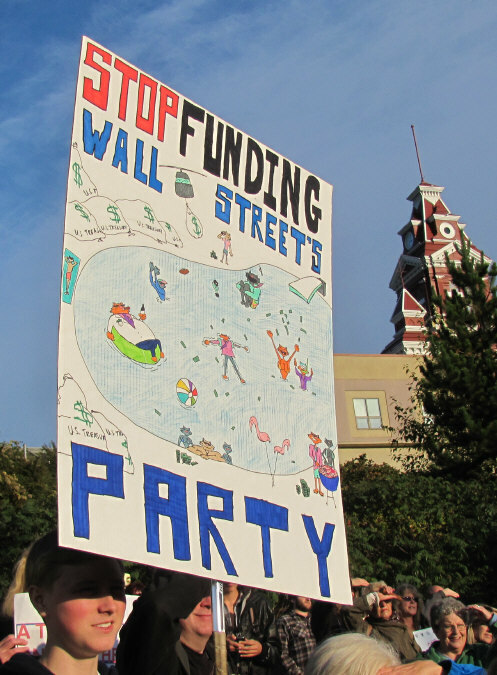 I'm not even sure I'm a hundred percent "sold out" fan of Occupy Wall Street, but there is a whole "raft" of interrelated issues being discussed. I see it as just another part of our cultural "paradigm shift." Seeking an economy that's better than what we have now. An economy that's more sustainable, in terms of the planet and our own well being. An economy that's more fair, in terms of distribution of income in society. The income distribution graph, in USA, has gotten out of balance over the past few decades. Continued below. Also Occupy Bellingham (the only one I've experienced) is kind of fun. Interesting people. A chance to see friends I haven't run into for a long time. It's community building that is face to face. The process of culture that's an alternative to other uses of time. Other uses such as shopping, watching TV, fighting traffic and yes, I do spend some of my time at work. I still have a job. I'm not just watching folks on the street playing bongo drums all the time. Sometimes folks play bongo drums in front of the building my job is in, but that's another story. 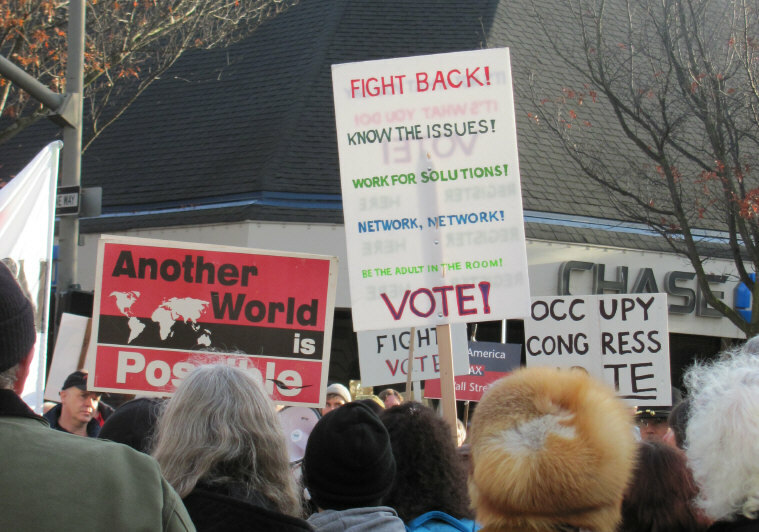 It's living in Bellingham, our "blue state" (for the most part) city. Someone on NPR interviewed an employee who works inside a Wall Street firm in New York City. They ask what people's reaction, inside Wall Street, was to the protests on the outside. Basically, that person said he thought folks were angry at the wrong thing. Rather than Wall Street, they should be angry at the Federal Reserve for printing too much money and devaluing the dollar, he said. Federal Reserve has been trying to keep the economy going in face of high unemployment. Also to keep the government debt financed so Uncle Sam "appears" solvent, at least. One can't really blame them for that. Seems like the blame can just go round and round which is why I see this as a cultural issue. It's a "paradigm shift" kind of thing. In that blog post, I suggested other strategies to deal with unemployment, like job sharing and better distribution of the wealth. Maybe that's considered "spreading the misery," but really, we might do better, as a culture, if we used a bit less. If we had a bit less waste. A somewhat more austere culture could continue to move forward, since new technology is always coming into the picture anyway. We could still progress toward more of a sense of prosperity. Prosperity can be defined in different ways. Much of our new technology points us in the direction of "smaller can be better." A big stereo system from the 1960s isn't necessarily better than an Ipod of 2011, just because it's larger. Smaller is sometimes just as good, if not better. We need paradigm shifts toward an economy that's better than we've got now. Better, but not necessarily larger or more consuming. An economy that offers a fairer deal to more than just it's top people. Much of it is about our overall sense of well being. We may not all define our well being in the same way, but there can be some new consensus about what our priorities are. 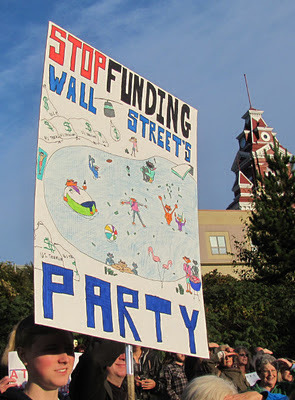 Some signs from Occupy Wall Street protest in Bellingham, October 14 2011. 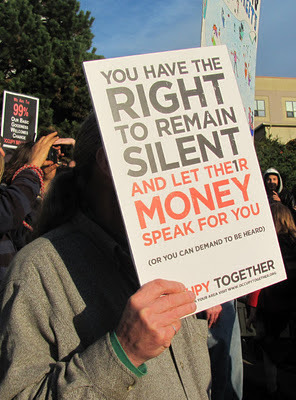 Below is compilation from some of my posts about the Occupy Movement. I am consolidating blog entries. 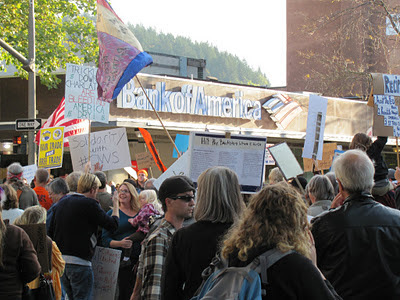 Protest in front of Bank Of America, Bellingham branch October 14 2011. One would think savers should be marching on the banks demanding better return on savings; rather than just worrying about a $5 per month debit card fee. Maybe the fee is just a tipping point. People are mad at banks. When I was a kid, banks often paid 5 1/4 interest on savings. Now, interest rates are rock bottom. Bad for savings, but cheap for borrowing; too cheap. Of course it isn't really the fault of individual banks, it's the world banking system, and things like the Federal Reserve that set overall interest rates. Part of the reason for the current financial crisis has been interest rates that are too low. When borrowing becomes too cheap, bubbles, such as the housing bubble, get inflated beyond what the normal economy can sustain. There's a disconnect if jobs don't pay much more then $10 per hour while single family homes sell for well over a quarter million. Segment a bit over 2 minutes. 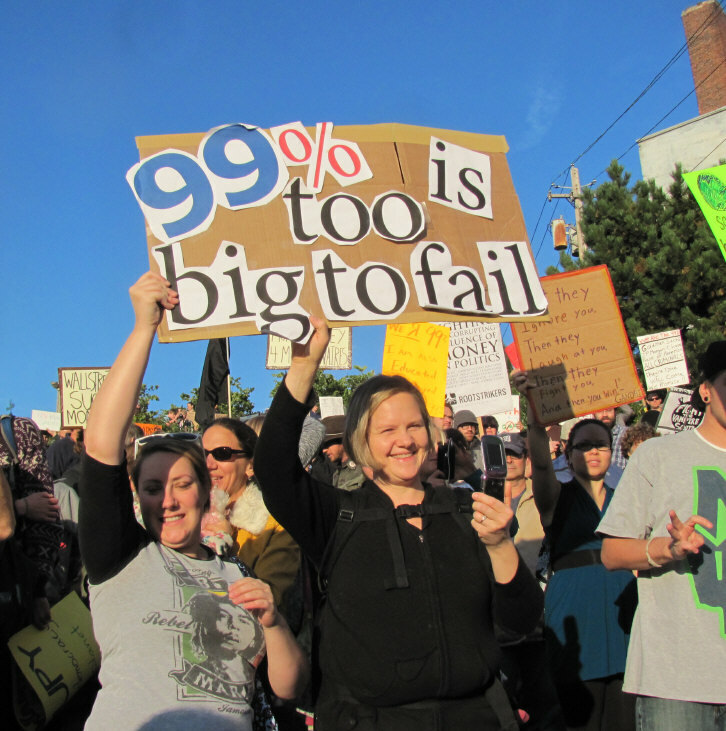 Occupy Wall Street is not necessarily pivotal in the evolution/revolution of our society. It's just another part of the long term paradigm shift toward what can hopefully be a more equitable economy. Also a more sustainable economy. It's good to see so many folks taking interest in the political process and the well being of the community as a whole. 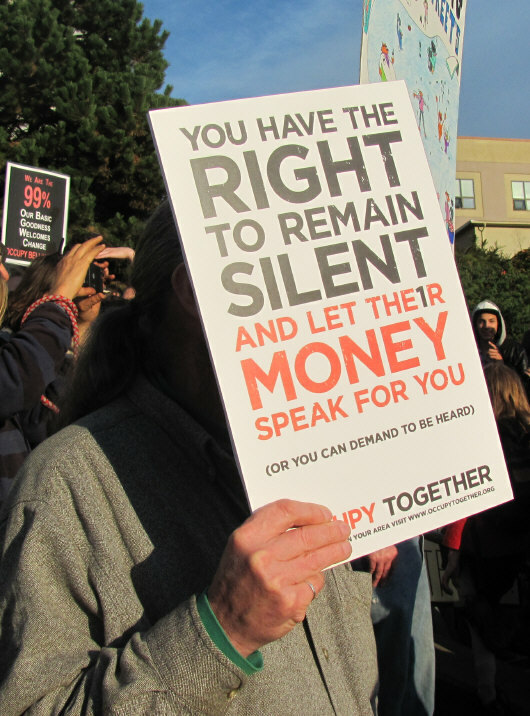 Not just personal profits and shortsighted self interests. Maybe some key congressional races in 2012 will be another step. Another rally of Occupy Bellingham protesters. November 4Th at corner of Magnolia and Cornwall. Rallies have been weekly for the past few weeks. The "reboot" sign is mine. 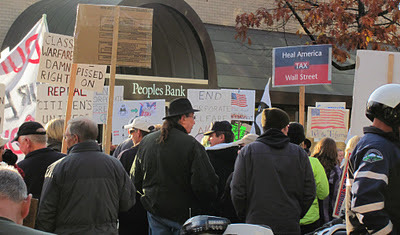 Fed up with not just the financial state of the country, I marched in solidarity for as many reasons as there were participants in attendance. I was proud to play a part, to do my part. And for the record, I'm one of those people who take the bus; my carless lifestyle (by choice) isn't always convenient, but my bicycle helps with that immensely. Even coming from Sumas. Taking a stand against the acquisition of fossil fuels...just another reason I was there on Friday. Good to hear from you. That was a clever sign. So many of the issues interrelate for sure. Congratulations on being car free.